Home » Blog » Comments » Countries » Cuisine » Featured Articles » music » tours » Travel » HOW JAMES BOND CHANGED A SWISS MOUNTAIN! 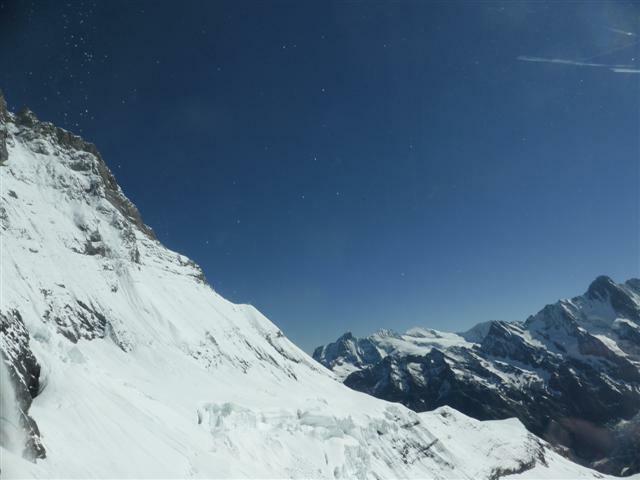 The Schilthorn, in the Jungfraujoch Region of Switzerland, had been famous since 1928 as the world’s longest downhill ski race sets off from there. A restaurant and cable cars had been started, but the finances had run out. 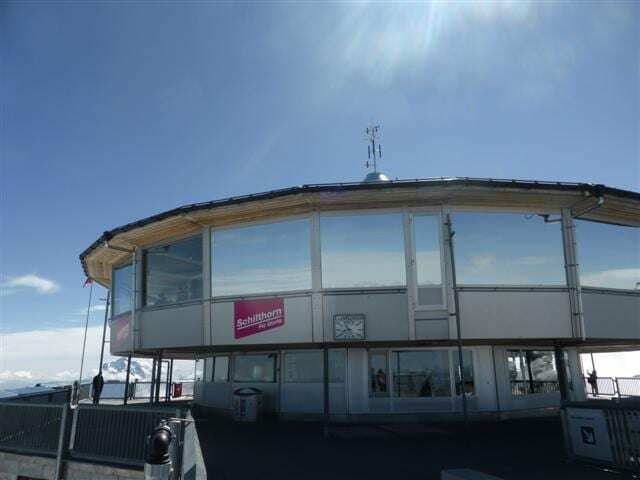 Then the famous producer of the James Bond films, Cubby Broccoli, discovered the Schilthorn and decided that it was the perfect location for his next film, On Her Majesty’s Secret Service. With his financial help, the cable cars were finished, a helicopter pad was built, and the wonderful revolving restaurant, Piz Gloria, finally opened. 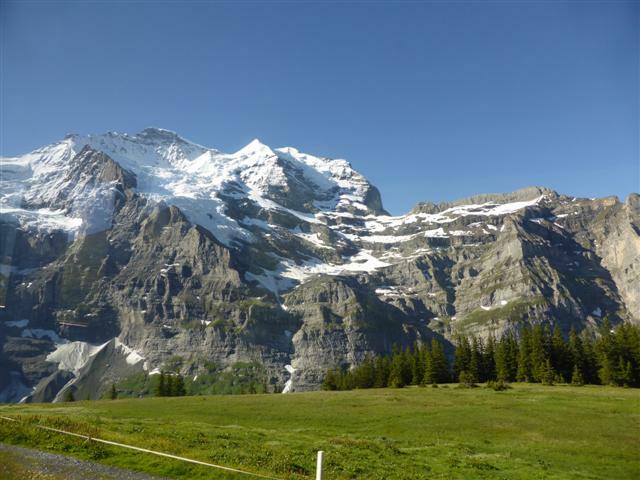 I was looking forward to my visit there as we set off by train from the mountain town of Wengen with our guide, Ursula. Next, we caught a bus, full of excited infants. Surely a couple of teachers weren’t going to take them all up the mountain? Yes they were! After that, we waited for our cable car in Lauterbrunnen Valley, known as the Valley of the Waterfalls, because there are more than 70 of them, both inside and outside the mountains. Up, up we went, changing cable cars several times. But we always stepped out of one and into another. They were all full of Chinese tourists waving their selfie sticks in the air. Our final cable car was waiting in Birg. The doors closed and one note of the James Bond Theme burst out. It’s instantly recognisable, and exciting! Ursula led us out at the second-to-last stop. All the selfie wavers carried on and we were almost alone. The Skyline Walk opened in 2014. It has spectacular views. Part of it is metal grilles and there’s a glass walk where you can stare down for nearly 2,970mts! Once again (see Jungfraujoch article) I was feeling a bit drunk and heady due to the altitude, so I shuffled slowly to the barrier to take some photos. We carried on to the James Bond Museum. Nick, one of our group, was really looking forward to this part. 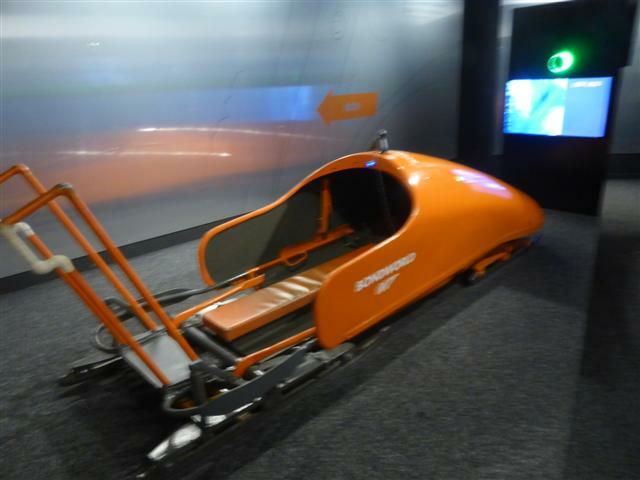 He and I ‘flew’ James Bond’s helicopter, then we ‘rode’ downhill in his bobsleigh, leaning from side to side as we followed the route on the film in front of us. George Lazenby starred in this film; his one and only part as James Bond. He took over after Sean Connery retired from the part. He had bad reviews, but I think he looked good. I had to pucker up next to his photo, and it looked as though we were having a passionate snog! Then we peered down into a mask and it shows the hair-raising ski trip down the mountain. Finally, there is a cinema with a short film. We walked up the steps to the next level and slid around on the helicopter pad’s snow. You can probably get a suntan while you freeze to death! 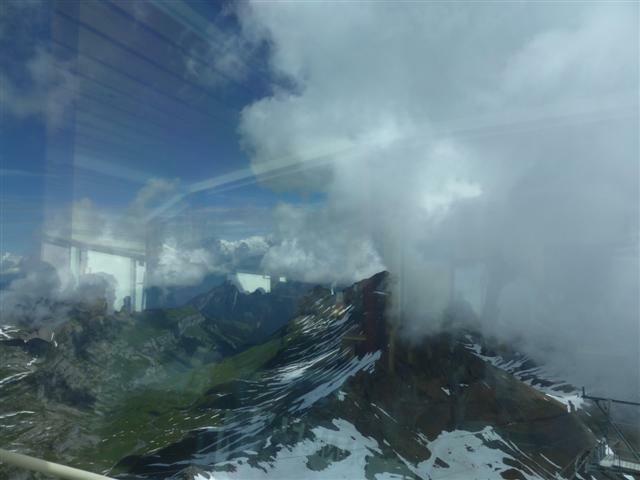 After that, we had lunch in the Piz Gloria restaurant. It rotates slowly, taking 47 minutes to rotate. I fancied a bowl of Oriental soup, so I went to collect it. It had to be good with all the Oriental tourists! Apparently, everything takes a lot longer to heat up at a high altitude. A kettle can take an hour to boil on Mt Everest. But my soup was hot, delicious and authentic. Clutching my bowl of soup. I turned round – and my table had vanished! Then I heard my name called and saw waving arms over to the right. But my bag and camera had disappeared from the window-sill! Had they been stolen, or hidden for a joke? No, there they were, round the other side. They’d moved. Well actually, it was us that had moved, The window-sill was fixed in the same place. Each window has a map in front of it, showing which mountains are outside. As we rotated, we could see more than 200 peaks! 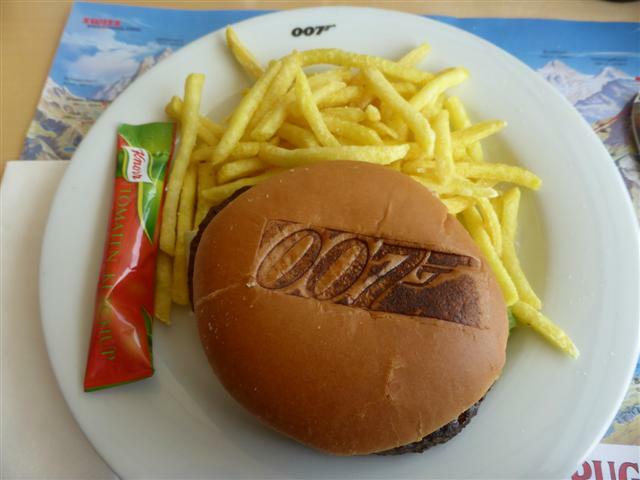 We all ordered the 007 Burger. I’m not a burger lover, but that was probably the best that I’ve ever had! It had 007 burnt on the top, and goodness knows what it weighed, but I could hardly lift it! You couldn’t eat it lady-like. You had to squeeze it, shove it in and bite! No, I didn’t eat it all, or the pile of chips with it. Before we left, I went to the loo. And guess what? When I came out, our table had vanished again! Back in the first cable-car, we were almost the only passengers. Not a selfish stick in sight! See what I did then?! SWISS operates up to 200 weekly flights to Switzerland from London Heathrow, London City, London Gatwick (seasonal during winter), Manchester, Birmingham and Dublin from as little as £38 one-way* (Geneva Economy Light Fare only includes hand luggage). The all-inclusive fares start from £63 one-way*, including all airport taxes. By road, rail and waterway throughout Switzerland: The Swiss Travel System provides a dedicated range of travel passes and tickets exclusively for visitors from abroad. The Swiss Transfer Ticket covers a round-trip between the airport/Swiss border and your destination.Prices are £104 in second class and £167 in first class.